John Devlin. 08/06/15 . GLASGOW. Police Scotland stock shots. Police , policeman , police officer , crime scene , forensic , locus , crime , cop , cops. 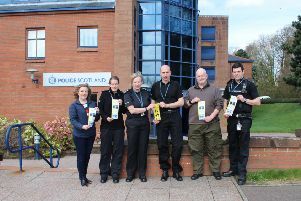 Police Scotland officers are carrying out extensive enquiries after a spate of thefts in the Bridge of Dee, Twynholm and Kirkcowan areas. The thefts happened sometime overnight on Thursday 5th to Friday 6th January 2017. In Bridge of Dee six houses and car, in the Bridge Road and Greenhall Road area were entered overnight. Property, including cash and jewellery were taken in some cases, whilst in others, nothing was taken. In three of these incidents, the intruder was disturbed whilst actually in the house, two within occupied bedrooms. A 13 year-old girl, a 63 year-old woman and a 35 year-old woman were all awoken from their sleep by an intruder in their homes at around 6am on Friday morning. In Arden Road in Twynholm, a house was the subject of an attempted break-in and a hat and jacket were stolen from a Suzuki Vitara car. In Main Street, Kirkcowan, two houses and the village hall were entered overnight and a quantity of cash stolen. Detective Constable Andrew Santangelli from Police Scotland said: “this is a very large number of crimes to have happened in the one night and clearly they may well all be linked. “We have been carrying out door to door enquiries in all the areas and are currently examining CCTV footage which covers some of the areas. “We really need the help of the public to help us catch those responsible for what are quite disturbing crimes. “The fact that those committing these crimes chose to enter houses where people were asleep in their beds is very unusual for our area. “One concerning aspect is that of all twelve crimes, only one needed force to overcome the security of the house or vehicle. “In the others, it seems that doors and windows may have been insecure. “We would ask that everyone thinks hard about any strange activity or suspicious incidents that they might not have thought about before on the Thursday evening or early Friday morning.